These words from King Henry to his men before heading into battle in Shakespeare’s Henry V epitomize the bond that few occupations posses. Firefighters are among these few. 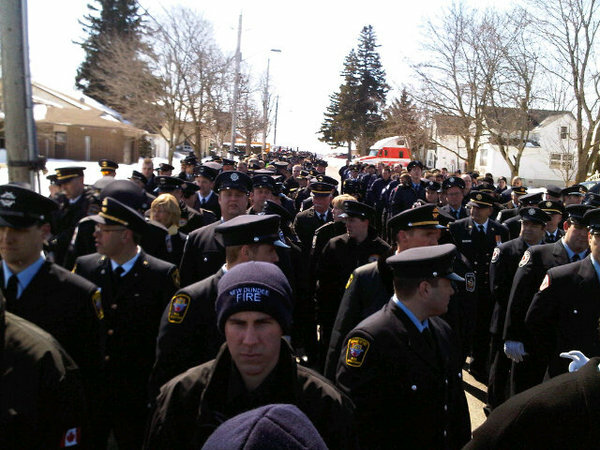 Today, my home town of Listowel laid two of its finest firefighters to rest after they gave the town their lives while responding to a massive downtown fire on March 17, 2011. The joint funerals of Ken Rae and Ray Walter at Listowel Memorial Arena not only celebrated the lives of these two remarkable men but accentuated the unique brotherhood that all firefighters share. Thousands of fireman from across the continent congregated in the tiny community to pay their respects to their fallen comrades. They created a sea of black that snaked for several kilometers down Main Street as they filed behind the hearses destined for the arena. As I watched the funeral procession and service online today, I was overwhelmed with feelings of both sadness and pride. The feelings of sadness are obvious but the pride that filled my chest as I watched thousands of men and women in black uniforms flank the streets of Listowel was incredible. I was proud because nameless firefighters reached out to a shaken community in a time of need. I was proud because I knew this overwhelming support helped the people of Listowel stand on their feet during a time when many wanted to lie down. I was proud to see the international firefighting community stand together and pay their respects to their fallen brothers. And finally, I was proud to know that their are literally thousands of men and women that are willing to put it all on the line to protect their communities the same way Ken and Ray did should the fateful call arise. 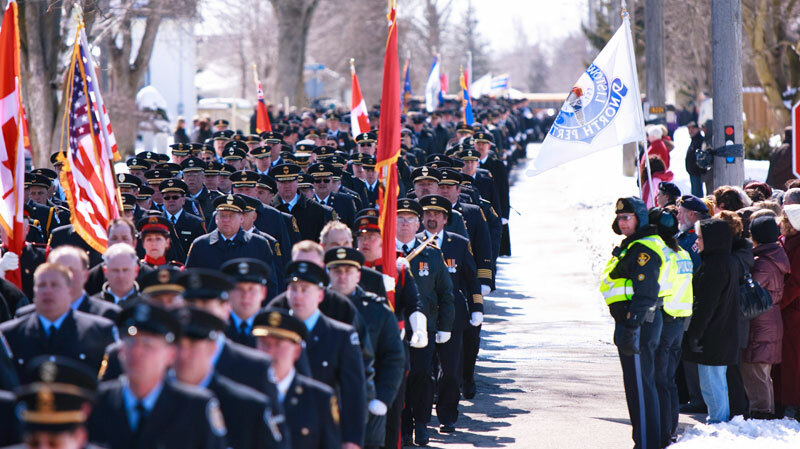 The risks firefighters face on a daily basis are often mitigated and overlooked by their remarkable skills; however, the events in Listowel on March 17, 2011 are a humbling reminded of these risks. Firefighters stand together, succeed together and grieve together. They truly are a remarkable band of brothers.